Neie is a junior at The University of Texas at Austin studying English Honors and Rhetoric & Writing. Her main research interests include American poetry, the rhetoric of the feminist movement, and young adult fiction. On December 31, 1956, writer and political activist Nancy Cunard visited the Keats-Shelley House in Rome. 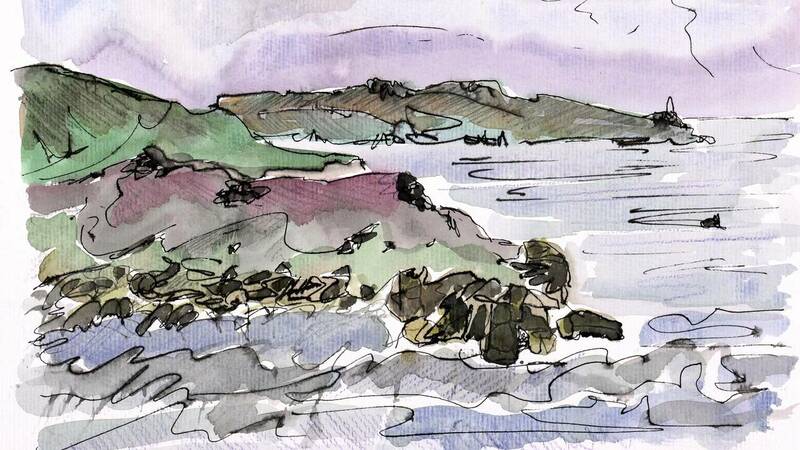 She went there to contribute an account of one of her earliest, most intimate experiences as a young writer and to memorialize her connection with one of the most important figures of the Romantic period, John Keats. Although Keats had been dead for many years before Cunard was born, she vividly remembered meeting him—in a dream. Cunard’s dramatic prose reflects her own dynamic life and personality. The British writer and political activist was the daughter of a baronet. She attended private schools in London, Germany, and Paris, where she met the friends who would later call themselves the “Corrupt Coterie.” Despite her privileged upbringing, Cunard was quick to jump into the fray of political activism and regularly spoke out against fascism and racism. The Ransom Center recently acquired several items relating to Cunard’s pilgrimage to the Keats-Shelley House in Rome, including Cunard’s personal copy of Neville Rogers’s book Keats, Shelley & Rome: An Illustrated Miscellany. Other related materials were laid in the pages of the book, including a postcard sent to Cunard by Vera Cacciatore—then curator of the Keats-Shelley House and a friend of Cunard—and a letter sent by Cacciatore, thanking Cunard for a recent review on Byron and imploring her to visit again. One highlight of this acquisition is the original typescript Cunard presented to the Keats-Shelley House, her four-page account of her childhood dream of Keats. These materials join the Ransom Center’s extensive Cunard collection, the bulk of which were acquired between 1969 and 1977. The collection includes manuscripts of her works, personal papers, and correspondence, as well as poems and essays by many of her friends and associates. The Center also recently acquired Cunard’s library. The Daily Beast: What can you learn about writers from their personal libraries? 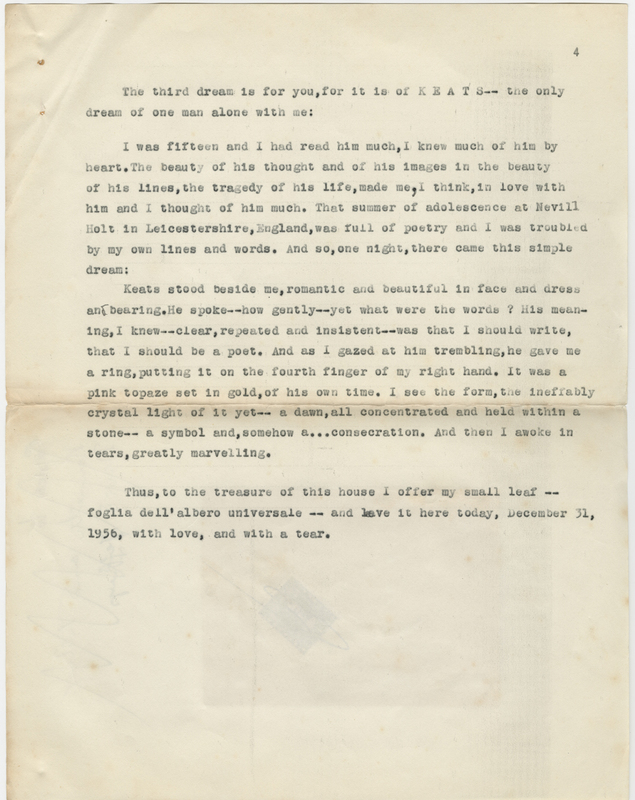 Image: Page from the original typescript Nancy Cunard presented to the Keats-Shelley House. The document contains her four-page account of her childhood dream of John Keats. 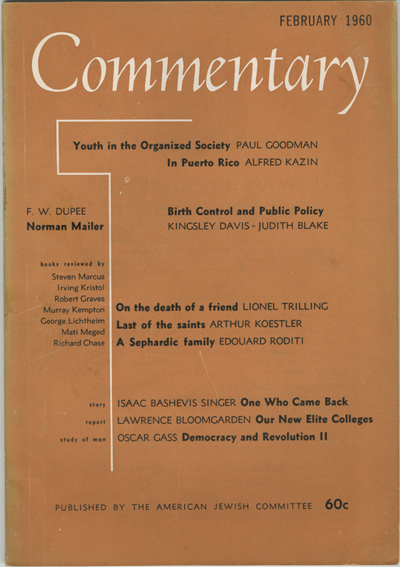 Cover of the February 1960 issue of Commentary magazine. Author Morris Dickstein presents the lecture “America’s Best Magazine? : Commentary in the 1960s” this Thursday, April 18, at 7 p.m. at the Harry Ransom Center. In 2011, Commentary magazine donated its archive to the Center, and the collection is now open for research. Founded in November 1945, shortly after World War II, Commentary was established to reconnect assimilated American Jews and Jewish intellectuals with the broader Jewish community and to bring the ideas of young Jewish intellectuals to a wider audience. Throughout its history, Commentary has published significant articles on historical, political, cultural, and theological issues in addition to fiction and memoirs. The magazine became a major outlet for leading figures to establish their intellectual careers. 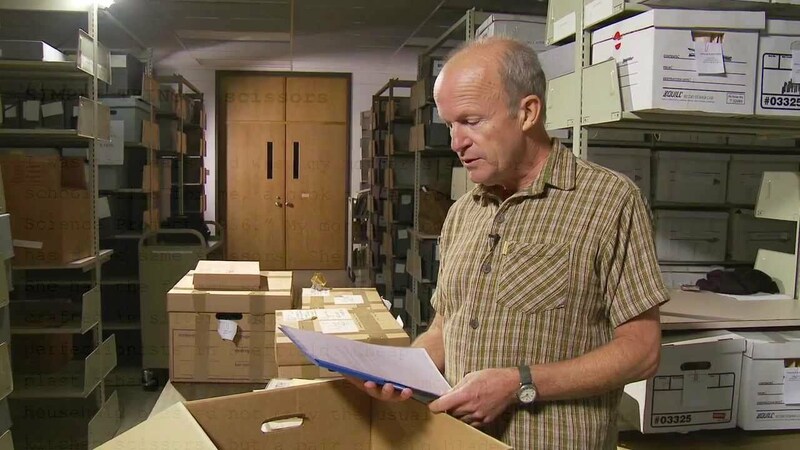 The archive spans from 1945 to 1995 and consists mainly of editorial correspondence, galleys, other records, and correspondence with a number of writers whose archives reside at the Ransom Center, including Norman Mailer, Bernard Malamud, and Isaac Bashevis Singer. Commentary underwent a dramatic shift in 1960 under the editorship of Norman Podhoretz, who applied more rigorous critical standards and made greater use of strong-minded New York intellectuals such as Irving Howe, Alfred Kazin, and Mailer. The magazine responded to all of the major controversies of the decade, from the Eichmann trial and the civil rights movement to the Vietnam War and the Columbia student uprising. Dickstein is Distinguished Professor of English and Theatre at the CUNY Graduate Center. His most recent book, Dancing in the Dark: A Cultural History of the Great Depression, received the Ambassador Book Award in American Studies in 2010. The event is free, but donations are welcome. Seating is limited. Line forms upon arrival of the first patron, and doors open 30 minutes in advance. The program will be webcast live. This program is co-sponsored by the Schusterman Center for Jewish Studies at The University of Texas at Austin. The Albert and Ethel Herzstein Charitable Foundation made a generous grant to support this program and the cataloging of the Commentary archive. 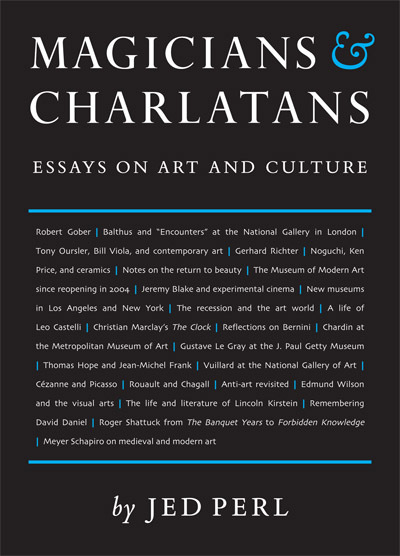 Art critic Jed Perl’s "Magicians and Charlatans"
Cover of "Magicians and Charlatans: Essays on Art and Culture" by Jed Perl. The Harry Ransom Center welcomes Jed Perl, art critic for The New Republic, and Peter Kayafas, Director of the Eakins Press Foundation, to discuss their work on Magicians and Charlatans: Essays on Art and Culture and the way that artists, writers, and publishers have responded to the digital age. The discussion takes place Thursday, February 7, at 7 p.m. at the Ransom Center. A book signing will follow. In Magicians and Charlatans, Perl distinguishes between artists he considers magicians—people who seek to create great art—and charlatans—who are merely seeking fame or profit. Perl does not shy away from making controversial assertions. In his reprinted 2002 essay on Gerhard Richter, he dismisses Richter’s retrospective as “a hymn to deracination, a visual moan.” He laments the commercialization of art, the age of Warholism, and the new “market-driven art world.” Perl offers praise for Meyer Schapiro, Lincoln Kirstein, and the eighteenth-century French painter, Jean-Siméon Chardin. Perl’s book, published in October by the Eakins Press Foundation, has received praise from The Atlantic, Harper’s Magazine, and The Wall Street Journal. Perl has been an art critic at The New Republic for two decades, and has written for Harper’s, The Atlantic, The New York Times Book Review, among other publications. He is currently working on the first full-length biography of Alexander Calder. “Mommy, is that God?” a little girl once whispered to her mother as Stella Adler swept into a party in New York City. The girl’s mistake was understandable: Adler was known as a presence of divine proportions, a tall, glamorous woman whose grand gestures and dramatic one-liners captivated audiences both large and small. Adler began acting at age four in the “Independent Yiddish Art Company,” run by her parents, and continued her acting career until 1961. In 1931, Adler joined the Group Theatre, where she worked closely with Harold Clurman and Lee Strasberg. In 1934, she went with Clurman to Paris to study with Constantin Stanislavski, an acting great famous for developing the Stanislavski System, a set of acting techniques that was tweaked by Strasberg and is known today as Method acting. Adler believed strongly that actors should use their imagination to synthesize characters, whereas Strasberg relied on emotional memory exercises, and the two eventually split over their differences. Adler left the Group Theatre and later opened her own acting school, The Stella Adler Studio of Acting, in 1949 in New York City, where she taught famous actors such as Marlon Brando and Robert De Niro. She opened another school, The Stella Adler Academy of Acting, in Los Angeles in 1985 with her friend and protégé Joanne Linville, who continues to run the school today. The Ransom Center hold Adler’s papers, which were used extensively by Barry Paris in his book Stella Adler on America’s Master Playwrights (Knopf). 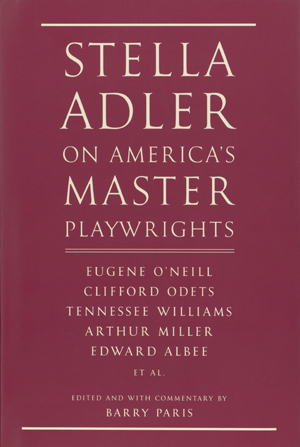 The volume peeks into Adler’s classroom and explores the acting master’s take on American playwrights such as Eugene O’Neill, Tennessee Williams, Arthur Miller, Edward Albee, Clifford Odets, and others. Paris, the book’s editor, did extensive research in the Ransom Center’s holdings on Stella Adler and Harold Clurman.